The date was given by the Murcia President, Ramón Luis Valcárcel. The new airport at Corvera in Murcia has suffered another delay in opening of several months. Summer 2013 is now being put as the earliest date the facility can be operational. The date was given by the President of the Murcia Government, Ramón Luis Valcárcel, who said that a thousand technical requirements and approval of the equipment used still has to be carried out. He said he did not want an airport with no planes, as has been seen in Castellón. The departure of Luis del Rivero from constructors Sacyr has apparently slowed down the paperwork in Madrid. From Murcia himself he was sacked last October as boss of the multinational, and had been the person putting the necessary rhythm to get the airport operational. The IU-Verdes spokesman for the Murcia region, José Manuel López, after hearing the airport will not open this summer, described the infrastructure as ‘ a never ending tale’. Meanwhile AENA has announced 22 extra flights this summer from the San Javier airport. Tipoa Rental Car at Phuket International Airport [HKT] , Thailand's second busiest airport and the gateway to all that Phuket and the surrounding islands have to offer. Millions of passengers each year visit Phuket to enjoy a wide range of tourist activities, natural beauty of the world famous Phuket beaches and fascinating attractions. Visitors to Thailand and Phuket for the first time may be concerned about the safety of driving on Thai roads. Well an important factor to consider is, what side of the road do they drive on? It is the left side, the same as in the UK, Australia and India. For a useful map on what countries drive on the left hand side visit that article and click on the MAP to enlarge it. The biggest adjustment you have to make when driving in Thailand, is the large amount of motorcycles. There are very few pedistrians. Motorcycles tend to drive in opposite directions to what they should on the wrong side of the road, and carry up to 4 persons. But the main roads are good and in fact flow quite well most of the time. BEWARE there are very few 24 hour petrol stations in Phuket . Don't get caught out, petrol stations tend to close at around 20:00 hrs. There is a 24 hour petrol station close to the airport, on the main road Thep Krassattri [ National Highway No. 402 ]‎ เทพกระษัตรี อ.ถลาง จ.ภูเก็ต ไทย to Phuket Town and the South of the Island. 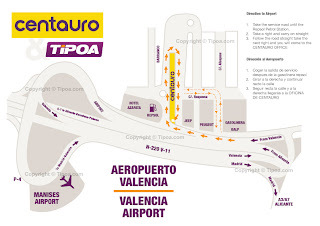 Tipoa Car Hire and it's suppliers are located just across the airport car park opposite the main airport entrance. If you have heavy bags we will come and collect / greet you. We also have locations at or close to the Major hotels, in Rawai, Patong, Laguna and Surin. Phuket also has many great Golf Courses, Blue Canyon is very close to Phuket International Airport [HKT] and Laguna is nearby. There is also Phuket Country Club, Phunaka, Loch Palm, and Red Mountain Golf courses. Tipoa Rental Car at Phuket Airport bring together all the major suppliers so you can compare all the car hire providers and come up with a vehicle/price package to suit your needs. Start now or enter another location, your car hire dates, review the best car hire deals from top Thai car rental companies, and book cheap car hire direct from Phuket Airport. Who drives on the left hand side of the road? When considering hiring a car an important factor is " what side of the road do they drive? " The map below will help you, destinations such as Thailand, Hong Kong, Australia, New Zealand. most of South Africa, much of the Caribbean, India and United Kingdom do so. 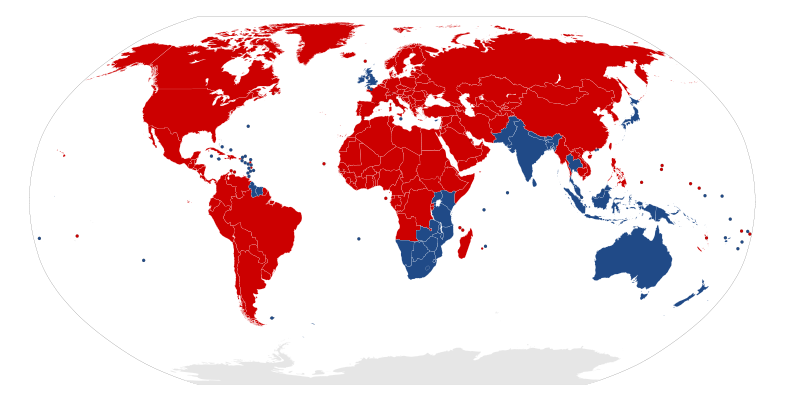 All the blue areas on the map below drive on the left hand side of the road. 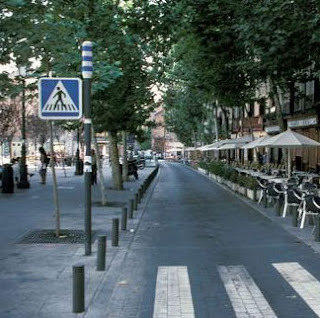 If you drive a rental car in Spain you must be aware of the way some pedestrians approach the cross walks. Instead of stopping at the edge of the sidewalk and check if there are cars approaching, they just keep walking. So please, slow down when getting closer to a cross walk and always keep an eye for any pedestrians trying to cross the road. Centauro is a Spanish rental car company that operates the Full/Empty fuel policy, when you make a reservation for more than 3 days. Like most of the car hire companies at Manises airport,Valencia Centauro have no desk at the airport terminal . Some rental car suppliers like Avis, Hertz and Europcar do have a desk , but ALL provide their customers with a prompt bus service to the nearby facilities in Manises Polygon, where the rental car fleets are located. This bus collects and delivers the customers outside Departures. On your confirmation voucher it explains this, so whether you arrive by air or to the airport by taxi, for example, you should stand just outside the airport in front of Departures and await the Centauro shuttle bus. If you are not arriving by air, you can go directly to their office and collect your rental car. When returning a car, then you always go to the same office. With Centauro if you rent a car for 3 or less days, you have the chance of returning it with the tank full and the initial amount of money you paid as a deposit for the fuel when you collected the car, will be reimbursed. I recommend that you take this option, as they charge you a premium amount for the initial full tank of fuel. So it is best that you do not return the car empty. Filling up the tank before returning the rental car is not a problem as there are many petrol stations at Manises Polygon. i.e. just a few meters behind Centauro local there are a Repsol and also a Galp petrol stations.